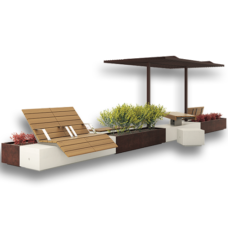 Rivola | id created, Inc.
Rivola urban lounger is made in your choice of granite, white marble or black marble Pietre di Marmo. Select desired finish: all sides sandblasted (granite only) or with flat surfaces polished and curved surfaces sandblasted (available for all materials). Standard Anti-Deterioration treatment for concrete. Freestanding. Add option: Anti-Grafitti treatment available for concrete.